Town Center Corte Madera’s center courtyard will be buzzing with satisfied sounds and enticing aromas as more than a dozen of the center’s food vendors and restaurants serve up complimentary samples of their most popular items – from sweet potato fries, to smoothies, to burritos, Hawaiian poke, pizza, shrimp rolls, BBQ and cupcakes. 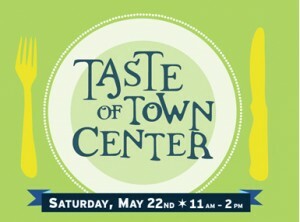 Taste of Town Center will take place outside in the center courtyard on Saturday, May 22nd from 11am to 2pm. Activities for children include free face painting and free balloons. This will be a perfect time to bring the whole family to sample the delicious offerings that are available at Town Center Corte Madera all year long, as well as a chance to visit their many unique shops. Restaurants and food merchants participating in Taste of Town Center include A.G. Ferrari, Baja Fresh Mexican Grill, Barnes & Noble Cafe, Bryan’s Fine Foods, California Pizza Kitchen, Champagne French Bakery and Cafe, The Counter Custom Burgers, Il Fornaio, La Maison de la Reine, Pacific Catch, PF Chang’s China Bistro, Sur La Table, Teacake Bake Shop, Tully’s Coffee and World Wrapps. Town Center Corte Madera, located on the West side of Highway 101 at the Tamalpais Drive exit, has become known as the Marin location for delicious healthy food, specialty clothiers and stores boasting unique home furnishings and gift items. Throughout the year, the Town Center hosts a number of community-driven events like the annual Trick or Treat Day for kids, the world’s largest Thanksgiving turkey which collects donations for Marin Community Food Bank, and free Christmas holiday gift wrapping by volunteers from Hospice by the Bay. For information, call 415-924-2961 or visit the Town Center website at www.shoptowncenter.com.